Being on Twitter and following hashtags like #MTBoS and #ITeachMath allows me to see classroom mathematics well beyond my physical horizons. I get to glimpse creative and engaging mathematics education around the globe. Recently I saw a couple of different ideas that I've tried to adapt and apply for myself. Math mysteries are an idea I saw posted on Twitter by Richard Perring (@LearningMaths). He shared a math mystery he created for completing the square. Many more of these activities are printed in his book Talking Maths from The Association of Teachers of Mathematics (ATM). The goal of the activity is to follow a set of clues in order to fill a 3 x 3 grid with the correct expressions or equations. There is a lot of thinking to be done in order to determine the correct placement of each expression. The puzzle like quality of these activities make them more engaging and purposeful. Since the Nova Scotia grade 8 classes are working on integer multiplication and division, I decided​ to create a math mystery of my own. Another nice source of math mysteries is the book Mathematical Team Games: Enjoyable Activities to Enhance the Curriculum by Vivien Lucas. I was looking for something completely different when I ran across a Treasure Hunt Math Activity on TES. This activity was created and posted by @colmanweb. It is a series of problems with corresponding solutions. The solutions are placed on a treasure map and as each problem is solved, the solution is crossed off. Once all the problems are solved there should be one remaining number on the map that has not been crossed off. This is the location of the treasure. I made a version of this activity for integer addition and subtraction. ​I liked this idea because it is relatively easy to create; just a find a series of questions with unique answers. Also, students get instant feedback. If their answer isn't on the map, they know they've made a mistake. I would call this purposeful practice as there is a goal to achieve at the end of the activity. There is a reason to persevere. Once students are familiar with the activity, you could give them a blank template (or they could hand draw their own version) and they could work in small groups to make their own treasure hunt activity (and answer key) and share it with each other. I recently read Mark Chubb's (@MarkChubb3) blog post on the role of practice in math class. 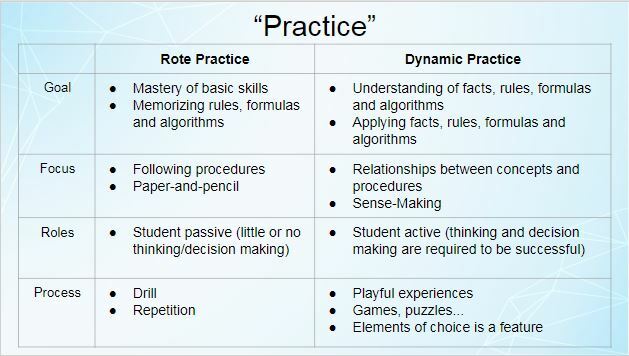 He discussed the differences between "rote practice" and "dynamic practice". Rote practice involves following procedures, drill and repetition while dynamic practice involves active student thinking, playful experiences and puzzles. I think that the Mystery activity is a more "dynamic" activity than doing the Treasure Hunt activity. However, I think that creating your own Treasure Hunt activity does involve additional characteristics of dynamic practice.